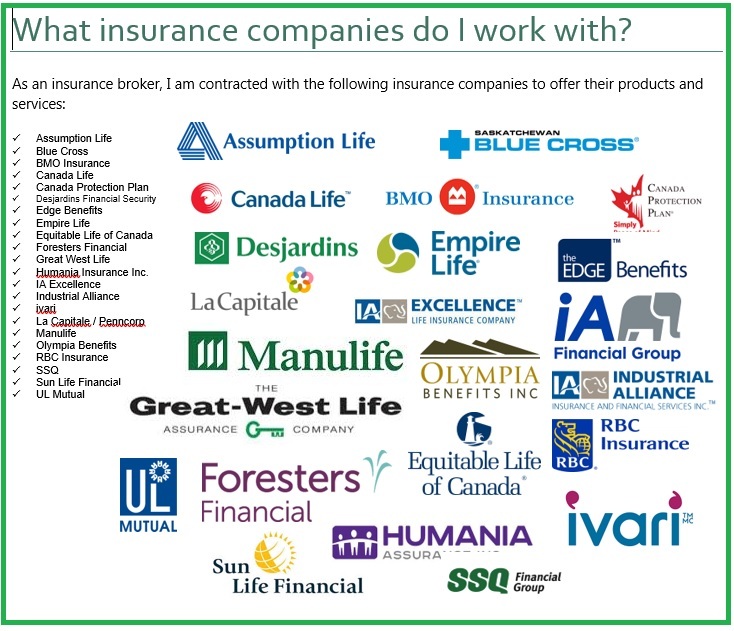 I can offer a full range of insurance products and services offered by the following companies: Assumption Life, Blue Cross, BMO Insurance, Canada Life, Canada Protection Plan, Desjardins Financial Security, Edge Benefits, Empire Life, Equitable Life of Canada, Foresters, Great West Life, Humania Insurance Inc., IA Excellence, Industrial Alliance, Manulife, RBC Insurance, SSQ, Standard Life, Sun Life Financial, Transamerica. I am licensed to sell insurance and investments in Saskatchewan and Alberta only. I am an independent licensed life, accident and sickness representative. I process my insurance related business through Financial Horizons Group (a Managing General Agent), which will pay me, or direct the insurance company to pay me, a bonus on commissions earned from the sale of insurance products that I sell. This bonus constitutes a portion of the overall compensation I am paid in conjunction with commissions referenced below. I am also a registered dealing representative with Raintree Financial Solutions, an Exempt Market Dealer. I am a Certified Financial Planner and I adhere to a special code of ethical conduct as administered by the Financial Planning Standards Council. I am also an active member of Advocis, our financial advisors association. In order to maintain my various licenses, I am required to meet mandatory continuing education. Where applicable, I meet these educational requirements through attendance at various seminars and industry meetings. Upon completion of an insurance or investment transaction, I will be paid a sales commission by the company that provides the product you purchase, which, is generally based on a percentage of the premiums. I may receive a renewal (or service) commission if you keep that policy in force. I may be eligible for additional compensation, such as bonuses or non-monetary benefits, such as travel incentives, conferences, seminars – depending on various factors such as the volume of my sales or persistency of business that I place with a particular company during a given time of period. Should your contract be cancelled within a certain period of time, I may be subject to a chargeback for a portion, or all of the commissions earned. No insurance company holds an ownership interest in my business, nor do I hold or control ownership in any insurance company. I am required to declare any interest that may prevent me from offering impartial advice. I will notify you immediately if there is a conflict of interest of which I become aware in regards to my services. I can offer you a full range of insurance products and services including life, critical illness, disability, long term care, segregated funds, annuities, health and dental, GIA’s and group benefits. I will, from time to time, collect financial and other information on you. This information includes transaction-related details arising from your relationship with or through me. I may obtain this information from a variety of sources, including your own records with me, transactions you have made with or through me, credit reporting agencies and other financial institutions, or references you have provided to me. You authorize me and my distributors, Financial Horizons Group and Pinnacle Wealth Brokers Inc., to collect and maintain this information when you apply for an insurance or investment product or service, and during the course of our relationship in order to administer the insurance product or service for which you have applied, and to fulfill our legal and regulatory obligations. For these purposes, we will have to share your information with third party services, such as paramedical service providers, and insurers to whom you are applying for an insurance product or service. You have the right to obtain access to the information we hold about you on file at any time to review its content and accuracy and to have it amended as appropriate. To request access to your information, to ask questions about our privacy policies, or to request that the information not be shared or used for the purposes outlined above, you can now, or anytime in the future, contact us. If you are no longer our client, or this agreement terminates, we may keep your information in our records so long as it is needed for the purposes described above or as long as it may be required by the law. You are not required to transact additional or other business with me as a condition of this transaction. Other than outlined above, your personal information will not be shared with individuals or other organizations. Canada’s anti-spam law (CASL) came into effect on July 1st, 2014 and may affect our ability to send you a commercial electronic message (CEM). This may include any commercial electronic message, which may include communications about regulatory changes, news, publications, education program, information and invitations to events that may be of interest to you. By providing us your email address, you consent to receiving emails from me pertaining to your financial plans. Should your email address change, this consent is still valid until you unsubscribe. This is for general information purposes only. The above information is not intended to provide specific investment advice to any individual or business entity and should not be relied on as such. Persons and/or business entities seeking financial and investment advice should always seek consultation from licensed individuals in their home province. Janea Dieno is licensed in all jurisdictions in which she provides financial services which include Saskatchewan and Alberta only. Janea Dieno is a licensed dealing representative for Raintree Financial Solutions, an Alberta-based Exempt Market Securities Dealership. Exempt Market Securities are offered through offering memorandum and subject to the provincial securities regulations in regions where they are sold. Always obtain a copy of the offering memorandum when considering an exempt market investment, and consult advice from a licensed investment professional.